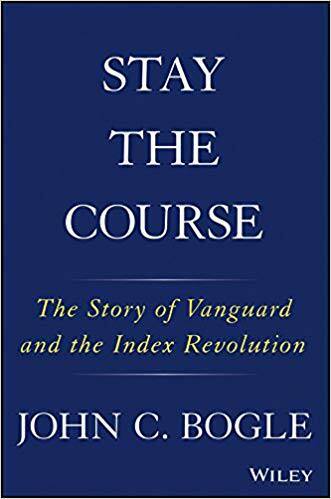 Here is the new Jack Bogle book "Stay The Course. The Story of Vanguard and the Index Revolution" scheduled for March 2019!!! Re: New Jack Bogle Book! I look forward to reading Mr. Bogle's next book. I have read and own all of Mr. Bogle's 11 books. I credit Mr. Bogle's teachings for giving me and my family a comfortable life-style free of financial worries. I live in the home that Jack built. Wonderful news - looking forward to Mr. Bogle's new book! The title" Stay the course" speaks for itself, yet all I see in on this Forum are numerous recent posts about getting rid of International or replacing TBM with CDs or MM funds because of a temporary downturn. Stay the course-except bonds. They are down this year and thus are no good. There is only one Jack Bogle. The rest of us are imposters. Just as Frank Sinatra kept coming out of retirement, John Bogle keeps writing his last book. I am very much looking forward to reading Mr Bogle's next book, his books are placed in my book shelf with the others classics. Isn’t it great? Personally I have learned so much! Yes it is. I have seen many of his videos and the more I see, the more I like him. His books have been excellent. No eBook (Kindle) edition? Or just not announced yet? [Answered] There will be, it's just not available yet. Preordered it from Amazon just now. Yes! I will get it the first day coming out. Be a super read!!! Can't wait to read his newest book! Just pre-ordered/pre-paid. Thanks for posting! Now: Can you remind me in March that I already ordered it? I was surprised over the years that Jack Brennan and Bill McNabb never wrote any/more books. Jack Brennan wrote one book. Thanks for posting Tony!! I'm looking forward to it!! I look forward to asking my local library to order it. Too pricey for just me. 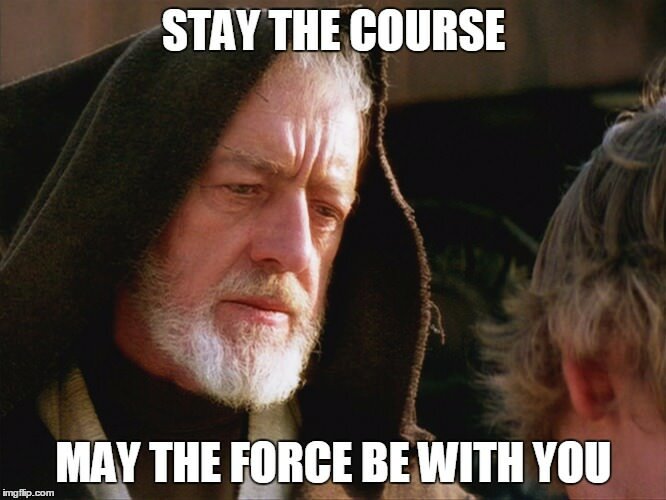 What experts say about "Stay-the-Course"
This will be Jack's best book yet!!! Will be a best seller!!! I have a spot on the bookshelf ready with all his other books in hard cover and perfect condition! I have learned much. And also unless valuations get really out of wack like they did in the late 90s according to the Gordon Equation that "you" probably don't understand, then sell most of your stock if that happens. But besides all that, yeah stay the course*****. I guess someone got up on the wrong side of the bed today. Pretty much what I have said is that during times of market extremes of valuation and sentiment you might want to make adjustments by as much as 20% of your portfolio. On the high side, take some off the top. On the low side, maybe buy some stocks. So when is selling 15% of my stocks in early 2000 selling "most" of my stocks? I have also said that these extreme events are pretty rare. During my lifetime, there might have been three really big buying opportunities. One would have been after the 1973-74 bear market and again in spring of 2009. There was a lesser opportunity after the 2000-2002 bear market. Pretty much, stocks fell 50% each time. Selling opportunities are harder to identify because markets can be too optimistic for a long time. Going from memory, the US Stock Market probably peaked about 1968 but the bear market didn't come until 5-6 years later. The bubble in the late 1990's lasted a while too. 2008-2009 was a different animal, Valuations as I recall were not nearly as high as late 1999 and early 2000, but this bear market was caused by a real estate bubble and not a stock bubble. I see these rare portfolio adjustments, overbalancing, more as risk control. Certainly as valuations and sentiment gets higher and higher, risks increase to the investor. Future expected returns decline as risk increases. The US Stock Market was effectively flat from 1968-1984 and again from 2000-2012. These happened in the aftermath of the go-go sixties and the high tech and internet bubble of the late nineties. Nobody, as they say, goes broke taking a profit. But I don't know when I have ever advocated selling "most" of everything. Selling 20% of my REITs wasn't selling "most" of my REITs. I saw warnings from Larry Swedroe and historically low yields on this and wasn't sure what to do, so I just took some from the top. I guess someone doesn't know a joke when they see it. I'm happy as a lark, Chief. But if I must be serious, as most of you know, Bogle hasn't always stayed the course as he didn't in late 99' as I pointed out, but he implores us to do so nonetheless. Don't get me wrong, staying the course isn't easy. How many could say they haven't altered their portfolio for a very long time, such as 20 years or more. Bogle of course can't, but who could? I guess I misunderstood your comments. I apologize. Yes, I have pointed this out about Mr. Bogle many times on the forum. The thing is, it is unclear what he actually did, there are a couple versions floating around out there. One place, Bogle says that he went from 70% to 30% stocks in early 2000. Another place, Bogle says he went from 70% stocks to 50% over a couple of years. I think the first version was Bogle thinking aloud and the second version was what he actually did. It would be a great question to ask at the next Bogleheads. As for me, I kind of, sort of, you know, maybe stayed the course. At least I had the good sense not to sell at market bottoms. I am human like everyone else. I was just trying to be cute, and sorry if that sent a wrong message. Speaking generally, I think very highly of Bogle and am very grateful for the changes he helped bring about in the investment industry. That being said, its my personal opinion that he's not necessarily a great "investor", though I certainly consider him very knowledgeable about investing. I admit I really struggle with sticking to my own strategy. It's something I'm continually trying to work on. So if anything, I do feel a little bit better knowing that even Jack Bogle acknowledges that there have been times that even he didn't do it. John Bogle has literally accomplished the impossible. Even though he has flirted with deviations from his basic philosophy, he has been remarkably consistent over the years. He made mistakes and took criticism but you don't succeed without failure and criticism along the way. After all, where is the great mutual fund colossus that Nedsaid built? It doesn't exist. In that light, Mr. Bogle looks pretty darned good. In the investment world, the guy is a Saint as far as I am concerned. One of the good guys in the business. For those that are stating they have read every one of Jack Bogle's books - don't you find them somewhat repetitive? Am I missing some new messages between the various books or do you also find them repetitive but enjoy reading the same messages with some refreshed data? Good point, if you already some of his other books he's telling you what you already know. Personally I have always enjoyed his teachings and life stories. Fascinating to me is a person who built an awesome company (and pushed profits back to shareholders). I have learned much and refer to his books as needed. In fact I purged most other books and gave to the library. Is it possible that there will be pre-release copies available for sale during the conference so folks can get it signed by the legend himself ? I haven't pre-ordered from amazon hoping that it will be available in early October. Yes! The index revolution!!! Will be Jack's best book yet!!! just listened to the podcast with rick ferri and jack bogle. looking forward to reading and sharing this book. i have been with vanguard since the early 90's. I was a futures trader for 29 years (retired). despite my trading background i somehow found vanguard and became a low cost indexer for my personal savings and retirement accounts. To say the least, I was in the minority on the floor of the CBOT. it was one of the best decisions of my life. i owe mr. bogle a great deal of thanks. Agree. I am an admirer of Jack Bogle, and just plain like him with his down-to-earth style and clarity. He has had a powerful influence in the investment world and on many investors including me. However, I do worry about elevating him to the position of a guru with a resultant cult-like following. I think excessive adoration of Jack really demeans him and what he has accomplished. I know this may prove to be a controversial opinion and I respect the right of others to feel differently but just as there is more than one way to Dublin, there is more than one way to admire and respect Jack. Last edited by Munir on Wed Sep 19, 2018 2:20 pm, edited 1 time in total. I have all of Jack's books and have learned something (or been reminded of something important) in every one of them. I will be ordering the new book soon on Amazon (and will use the Bogleheads link). azanon wrote: ↑ But if I must be serious, as most of you know, Bogle hasn't always stayed the course as he didn't in late 99' as I pointed out, but he implores us to do so nonetheless. . . .
As you know, Jack Bogle has changed his asset allocation over the course of his 89 years, which is precisely what he suggests all prudent investors should do as they get older and their life situations change. Adjusting one's asset allocation to comport more intelligently with changes in life is not the same as "not staying the course" and does not violate his advice to "stay the course." To "stay the course" means to stay invested according to your asset allocation and to not buy & sell based on market fluctuations. Q (from a Boglehead) - How do we know when to change our asset allocation? When do we do so based on high market valuations? A (by Mr. Bogle) - In 2000, he changed his asset allocation. "It was not a sustainable market, there were serious problems, stocks were very high - AND because I was in the hospital with serious heart and health issues including a 10-hour heart procedure, I wanted to make sure that my portfolio was secure for my family." His primary concern was his health and family AND he called his lawyer from the hospital emergency room and told her "You never sent me the papers to sign for my will that you said you would!" His lawyer came to the hospital emergency room with the papers. Mr. Bogle told us: "The subtle pressure of an uncertain life has dictated more of my investment changes than you would realize." Azanon - I simply don't agree that Mr. Bogle fails to "stay the course," but "implores us to do so." azanon wrote: I admit I really struggle with sticking to my own strategy. It's something I'm continually trying to work on. So if anything, I do feel a little bit better knowing that even Jack Bogle acknowledges that there have been times that even he didn't do it. "The biggest mistake is to react to the market . . that when you think the market is high, you get out." He explained that "if it makes you feel better, change your asset allocation - BUT never get out of the market." If necessary, "sell to the sleeping point." "Just be careful about doing anything - don't make big jumps." "There is no precise answer . . . it depends not only on financial analysis but your emotional ability . . . there is no precise answer." I wish it was as easy to do as it is to say: sell equities to the sleeping point. What people view as their sleeping point is not fixed over time, and tends to fail them at the darkest moments of market turmoil. You really don't know what is your sleeping point until you've lived through your first or second bear markets, or market crashes. Just for the record miriam2, I think static portfolios (for life) are superior to changing ones. Just as an example, take a Vanguard Wellesley for example. Who really needs more return than it provides? And who would actually consider it too risky (at any stage in life)? For question 1, someone greedy maybe, or someone not saving enough? For question 2, someone who needs a financial adviser to help them develop rudimentary risk tolerance. I'd also reference work/study at portfoliocharts.com. A few incredible portfolio examples there with incredible returns, and very tolerable risk levels. Now that's staying the course - portfolio for life. My opinion on Bogle is unchanged. We just disagree. azanon wrote: ↑ Just for the record miriam2, I think static portfolios (for life) are superior to changing ones. Just as an example, take a Vanguard Wellesley for example. Who really needs more return than it provides? And who would actually consider it too risky (at any stage in life)? For question 1, someone greedy maybe, or someone not saving enough? For question 2, someone who needs a financial adviser to help them develop rudimentary risk tolerance. Actually, Jack Bogle would agree with you - for certain investors. At the recent Bogleheads Conference, Mr. Bogle repeatedly pointed out that personal investing is decidedly personal, reflecting one's own personal situation. His only broad-based advice is to use low-cost, high quality, diversified investments to create a simple portfolio that you can track and understand and stick to in good times and bad, a portfolio you won't be tempted to sell in a panic or buy in greed - and never stop investing. And also, he told us (again) that he uses the Vanguard Balanced Index fund, a 60/40 fund, forever for his grandchildren. Every year, he gives each grandchild a contribution in that fund. He said: "It won't go very far up but it won't go very far down," it's "very boring" but "it's not necessary to tinker with" and "it's very easy to maintain and administer" and moreover, "the fund does fine, even beats many endowments." Then Mr. Bogle laughed: "It's amazing how much money you can have by putting away, contributing a nice sum of money every year for 25 years. These damn kids are rich!" The beauty of financial simplicity! Amazon has Mr Bogle's latest book at $22.45. I pre-ordered on August 27 for $34.95. However, my final cost will be the lowest it has sold for at Amazon thru end of day released. Price reduction is automatic. I thought I was done with purchasing investment books, but Ithink this is now on my purchase list.